Fall Is Here and I'm Celebrating with Cookies! The warm spices of cinnamon, nutmeg, and ginger bring out the true essence of autumn. Add pumpkin to the equation and it's a party!! 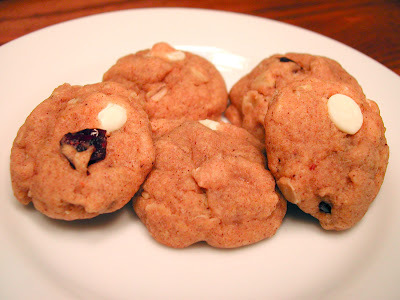 This is a really easy cookie recipe using Pillsbury Quick Bread and Muffin Mix. With a little doctoring, it really works! Heat oven to 350°F. In large bowl, combine quick bread mix, oats, cranberries, cinnamon, nutmeg and ginger; mix well. Add butter, water and eggs; mix well. Add in white chips. Drop by heaping teaspoonfuls 2 inches apart onto ungreased cookie sheets. Bake at 350°F. for 10 to 12 minutes or until bottoms are golden brown. Remove from cookie sheets. You should enter the Pillsbury Bake-Off with this recipe! Question: Are you going to try making anything with fresh pumpkin this season? I'm debating this. I always use canned pumpkin. Maybe I'll make a pie. Making fresh pumpkin is easy. You just slice it, scoop out the seeds, and bake it until it is soft. The main thing you have to be sure to do is squeeze out all the water after baking. I use cheesecloth to do this--just plop some in the center of a square and twist and twist until no more water wrings out. If you don't do this, your recipe will be ruined with too much water.